Home Blog New sound effects: Vehicle SFX and fierce creatures, ethereal soundscapes, lots of jet skis, & so much more! We’re back with our biggest-ever highlight of new sound effects libraries – and we’ve got tons of new sounds to share with you, including vehicles of all shapes and sizes, and diverse sources and creative designs. If you are looking for automobiles, check out the Peugeot jeep and station wagon. For something bigger, like a WWII tank, listen to the Sherman M4A3 and Stuart M5A1. If you need something lighter and buoyant, we have sounds of Kawasaki, Sea Doo and Yamaha jet skis. And for something that flies, an F16 should do, or perhaps a collection of 10 different models at Heathrow! We also have ambiences of worldwide airports, Central America, the city of Kolkata, the Saharan Atlas Mountains, quiet deserts and leafy foliage; plus sounds of cameras young and old, molecular soundscapes, household fans, presets for Serum, abstract guns, various canines, aggressive doors, game UI events, transitions, AK-47s, ethereal metal, manual and electric tools, various props, expressive winds, blockbuster booms and hits, and Surround Sound Lab’s full offering of libraries. And if you haven’t already, check out the new tool Igniter for all your car behavior needs. Happy listening! 'Motor Fan' by Anti-Node Design gives you both internal and external mechanical sound from household items. You'll hear motors and compressors from air conditioners, heaters, refrigerators, microwaves, toasters, juicers, washing machines, chain saws, and more. 'Rare Winds' by Articulated Sounds is an ambitious project of winds from remote places across the world. Included are authentic recordings from Boreal and Austral regions, Islands in Mediterranean region, the Sahara desert, Isle-aux-Grues, and more. 'Whoosh: Leafy Foliage' by Thomas Rex Beverly gets you a fluttering, rustling collection of flying foliage with 6-foot cottonwood branches, delicate heart-shaped leaves, stringy fern root bundles cutting the breeze like bullwhips, sago palms swishing with breathy whistles, and more. 'Nature Roomtones: Deserts' by Thomas Rex Beverly is a collection of ambiences with zero wildlife and barely audible wind. It offers you an extensive selection with sparse flora and no fauna from desert winter nights, allowing these sounds to be used as a foundation for any natural environment you create. 'Igniter Full Tank' by Krotos Audio includes their powerful tool that enables you to manipulate vehicle behaviors directly in your DAW, as well as 1,943 audio samples, 24 vehicles, 200 presets, and 75 GB of recordings of sports cars, motorbikes, planes, helicopters, spacecraft, moving ambiences, textures, and Foley. 'Wroclaw Impressions' by Detunized delivers sounds from one of the most vibrant cities in Poland. Situated by the Odra River, Wroclaw has clearly arrived in modern times without blurring the traces of its eventful history with calm residential and pedestrian areas with narrow streets, countless tramways, numerous churches, and sacral buildings. 'Monsters & Beasts' by BOOM Library gets you a horde of earth-shattering beasts that come to life with timeless roars, hisses, bellows, screeches, moans and more terrifying sounds. Construct your own with numerous authentic animal recordings as well as human and prop elements with its construction kit, designed library and special bundle. 'Data Transfer' by Alexander Gastrell is a collection of 52 designed analog and digital sounds that characterize the sounds of data being transferred through the internet, radio transmissions, satellite, broadcast and telecommunications. It also contains sounds for AI, sci-fi soundscapes, pulses, static, glitches, uploads, interference, and more. 'Peugeot 307 SW 2004' by Pole Position Production features 463 clips (18 GB) of a 2004 French model. You'll get a total of 27 takes depicting the sound of the car's 2.0-litre 134-horsepower petrol 4-cylinder engine. The collection includes 19 perspectives of the car from the engine, exhaust and interior. 'Stuart M5A1 Light Tank' by Pole Position Production covers startups, idling, blips, steady RPMs in neutral, various driving techniques, acceleration and deceleration, gearing, departing, approaching, stopping, passing by and much more. It also contains sounds of the engine dying and gears grinding. 'Peugeot P4' by Pole Position Production includes 26 recordings from a French military unarmored off-road jeep. It includes a total of 276 sound clips (9.5 GB), including both onboard and exterior clips at slow, medium, and fast speeds, plus exterior perspectives of departures, passes, arrivals and 3-point turns, and effects of doors and switches. 'Sherman M4A3 Medium Tank' by Pole Position Production includes 183 recordings in a variety of mono and stereo perspectives for a total of 25+ GB of audio. This vintage military vehicle is detailed in 16 exterior and 12 interior channels with coverage of starting, passing by, approaching, departing, stopping, and onboard driving at different speeds. 'Jet Ski: 2017 Kawasaki SX-R' by NoiseFloor FX is a selection of the full jet ski library that features this Kawasaki jet ski and its 1,500cc inline 4-cylinder 4-stroke engine. It includes 119 pass bys, shifting, tricks, taking off, wave skipping, and more. 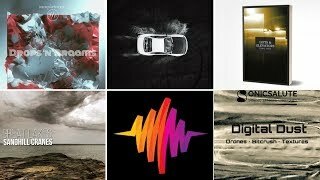 'Metal Souls' by Sound Spark LLC was meticulously crafted by hours of experimenting with different processing techniques with a vision to make something ethereal and vocal but also a bit vague, providing excellent source material for a wide variety of applications. 'Old Cameras 192kHz' by Soundholder features 69 recordings of different camera-related activities from 13 different cameras for a length 52 minutes. 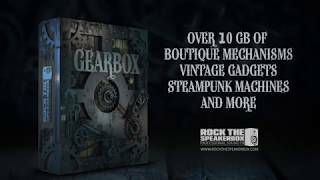 Inside you'll find sound effects like rewinding film, pulling different levers, rotating dials, shutter effects, handling noises, aperture clicks, mechanisms and more. 'Kolkata City Surround Ambiences' by Attic Sound Ltd features over 25 locations and 276 files of both day and night time recordings in 5.1 and stereo formats. Feel the relentless energy of Bagbazar Street and the traffic rumble over Howrah Bridge, and walk through the flower market along the Ganges river. 'Quantum State' by MatiasMacSD is a collection of 30 soundscapes aimed to be used in movies, games and documentary films. It was created to evoke the atmosphere of a Quantum World, so if your protagonist is trapped in a molecular space, this sound pack can be great tool. 'Point And Shoot: Fuji Cam Edition' by PMSFX is a collection of 346 carefully recorded and mastered camera sound effects. It has sounds of the shutter, rotary dials, buttons, aperture ring, handling, powering on and off, inserting battery, SD cards and more! Collection was recorded using two top tier Sennheiser microphones. 'Jet Ski: 2014 Modified Yamaha Superjet' by NoiseFloor FX features this Yamaha jet ski and its 700cc 2-cylinder 2-stroke engine. You'll hear pass bys, turns, shifting, water skips, and much more in 129 files. 'Abstract Guns' by PMSFX is a collection of 165 abstract and imaginary gun sound effects from 33 weapons, including blasters, rifles, energy weapons and more. You also get 5 versions per weapon in single shots as well as Soundminer metadata. 'Jet Ski: 2015 Sea Doo Spark' by NoiseFloor FX gets you sounds of this jet ski with its Rotax 900 ACE engine. You'll hear 120 recordings of sharp turns, idling, tricks, pass bys, taking off, accelerations, general riding, and more. 'Igniter' by Krotos Audio is the new industry standard for creating real-world or sci-fi vehicle and engine sounds with ease. 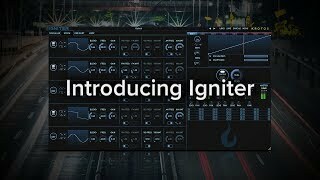 Igniter enables you to design, perform and automate any complex vehicle behavior directly in your DAW. 'Serum SFX' by Glitchedtones is a collection of 60 versatile SFX presets for Serum including risers, textures, transitions, drones, atmospheres, retro video game sounds, glitches, whooshes and abstract elements. Suitable for any style of production, each preset comes loaded with 4 Macro controls giving you the flexibility to go way beyond the 60 presets into hundreds of variations. 'Props Box 2' by Soundholder is a collection of different sounds emitted by everyday objects used in weird ways. It can be a great and handy tool in designing more complex sound effects for games, or just a go-to pack to quickly fill the gaps in movies and other linear media. The library gives you 193 files, featuring more than 2,000 and nearly 4 hours of edited and mastered sound effects. 'Surround Sound Lab Complete Collection' by Foley Collection & Surround Sound LAB is a bundle containing the whole SSL Catalog, getting you 3,000+ files, 180+ GB of audio and free updates as the catalog grows! This one-time bundle purchase gives you access to everything, including future releases! 'The Dark Hits' by TH Studio Production lets you dive into the dark with this trailer sound effects library with booms and dark hits. Created by Tihomir Hristozov, a sound designer and composer with placements in trailers for blockbusters such as Godzilla: King of Monsters, Scary Stories to Tell in the Dark, Ready Player One, Red Sparrow, and others. Dive into the dark with this trailer sound effects library, featuring booms and dark hits. Created by Tihomir Hristozov, a sound designer & composer with placements in trailers for blockbusters such as Godzilla: King of Monsters, Scary Stories to Tell in the Dark, Ready Player One, Red Sparrow, and other. 'F16 Maneuvers' by Sound Ex Machina features 36 recordings of F16 Fighter jets captured at 3 different locations from the ground perspective. You'll get 22 sounds of flight formations (up to 6 air crafts), 8 contact mic recordings from a nearby parked vehicle (for some low tones and rumbles for sweeteners), and 4 mixing sessions that combine ambient and contact mic recordings. 'Jet Skis: Sea Doo Spark, Kawasaki SX-R, & Modified Yamaha Superjet' by NoiseFloor FX includes 3 different high performance racing jet skis: the 2015 Sea Doo Spark, 2017 Kawasaki SX-R, and a 2014 Modified Yamaha Superjet. The full library has 386 files with each set including 2 stationary pairs of the Sennheiser 8040s and Sennheiser 418, and a Shure SM57 on the engine! 'Toolkit For Airports' by blazznet productions is an extensive collection of airport ambiences from departures, arrivals, passport control and luggage reclaim halls from cities like Venice, Saigon, Istanbul and Trieste, as well as voice-only announcements and designed chimes in the styles of the ones heard all over the world. 'Angry Door 192' by Lukás Tvrdon enriches the SFX world with new expressive door and gate sounds, both source and designed. It has everyday noises along with fantasy sounds, like dungeon metal doors, high-pitch squeaking wire gates, heavy church gates, etc. It also includes hard, heavy and wildly designed "angry" versions. 'Baltic Ambiences' by Tim Nielsen has 440 various ambiences across Iceland, Finland, Sweden, Norway, Denmark, Germany and Poland. Here you'll find sounds of city streets, museums, churches, restaurants, train stations, airports, train cabins and ferries. 'Els' by Michaël Anctil is a library that contains electromagnetic field recordings. It features distinctive, "musical" source material ranging from household objects, drones, vehicles and radiology equipment recorded with a LOM Elektrosluch Mini City. 'Victorian House Doors & Bells' by Immersive FX features a Victorian Town House in London that has been preserved with its original furniture, decorations and facilities. This library has recordings from its basement to top floor with sounds of various doorbells, servant bells, wooden doors, a dinner gong, and more. 'Game and UI Interface Pack 001' by LA Sound is the first in a series of 'Game & UI Interface' sound effects, and it brings you unique button clicks, hits, movements and special sounds perfect for apps, games or animations. All sounds have been meta tagged so they'll be easily to find in Soundminer. 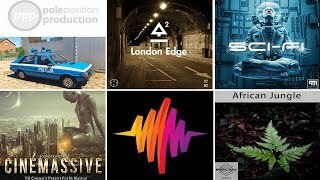 'Transitions 003' by LA Sound has sound effects that were carefully created using a variety of processing plugins and techniques, giving you an arsenal of unique SFX for your next productions. You'll get air movements, hollow build ups, fast swishes, spiraling risers, sci-fi gusts, whistling pass-bys, and more. 'AK-74' by Flysound is an all-angle library that includes recordings of distant shots with a Sennheiser Ambeo and Neumann U87s in quadro formation, capturing all the sound versatility you'll need for a fully dynamic project. Also included are several pre-designed mixed sounds for quick-use without additional mixing needed. 'City Life: Central America' by Phonography was captured across three Central American countries: Mexico, Guatemala and Nicaragua. This library focus is on city atmosphere, especially in street markets, pedestrian areas, parks, and more, recorded with a discreet setup of a Sennheiser AMBEO or AB stereo setup with two Sennheiser MKH 8040s. 'Flypast' by WW Audio is part of the WW Audio 'Mini SFX Series' for those who want quality recordings without having to buy large libraries. This collection brings you 10 different models of airplanes flying overhead to land into Heathrow Airport. Each model of airplane has its own unique sound. If you want that great flyover sound, this library is a must for your collection. 'Dogs (SO)' by Soundopolis is a collection of 14 breeds, covering all aspects of a dogs life: barking, growling, whining, whimpering, playing, eating, sleeping, and walking around. There are in-your-face sounds, subtle sounds, Foley, and 14 ambiences - all from pointers, German shepherds, border collies, Jack Russell terriers, Maltese shih tzus, New Guinea singing dogs, Weimaraner puppies, yellow labs, Yorkshire terriers, pit bulls, mutts, and more. 'North African Desert, Steppe & Shrubland' by Fleeting Sound was recorded in Spring at the edge of the Saharan Atlas Mountains in eastern Morocco, reflecting the sound of the deserts and other arid habitats of North Africa and beyond into the Middle East. Plus, 20% of your purchase will go directly to Harmusch Estudio y Conservación de Fauna conservation research organization. 'Construction & Tools' by The Sound Pack Tree features manual and electric hand tools as well as construction vehicles, diggers, drills and power saws. All sounds in this library have been edited carefully and many files are seamless loopable to ease your audio workflows. There are also two versions of the libraries with the takes on separate tracks or similar sounds combined on onto single files. ← 9 New Podcasts Worth Hearing: Gary Rydstrom, VR Horror, Game Audio, Voice User Interfaces, Sound Healing, and much more!